Each customer that buys will be enticed to purchase more or less, depending on your branding approach, offers, and website. You can increase the lifetime value of your customers by increasing the amount they buy in a given purchase. This is known as a customer's average order size or average order value. 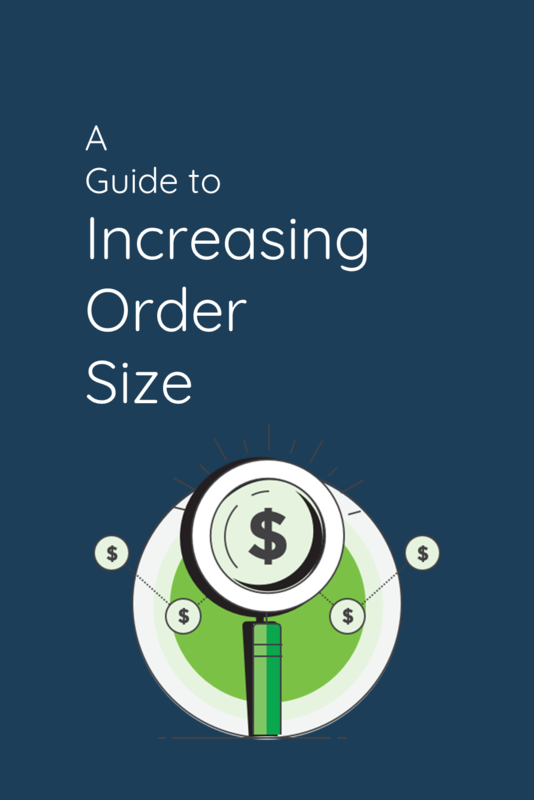 We will explore some proven tactics by eCommerce companies to help increase average order sizes. Customers love free shipping. In fact, a customer is 71% more likely to purchase from a brand that offers free shipping. You can use this tactic to increase your order threshold. Offer a Regular Deal: A big number of your customers (40%) will change the way they shop based on the ability to benefit from free shipping. Customers will choose to go out of their way to pick up items from a store or even spend more to qualify to free shipping. You can use this to your advantage by offering a regular deal for free shipping with a minimum qualifying order. You can base this number by examining the average order value and then setting the threshold a bit higher. You can also choose to offer discounted shipping on orders within a different price bracket, encouraging those customers to purchase as well and potentially raising your lower purchases higher. Your logistics provider can help you determine tiered shipping costs so that you know exactly how much it costs to ship your products and how much of a break you can offer your customers without hurting your bottom line. Free Shipping for Specific Products: Not all products are going to cost you the same amount to ship. Avoid free shipping on heavy or large items so that you aren’t losing profits. List some products at a slightly higher price and then offer free shipping on those items. Limited Time Offer: You can offer free shipping promos for smaller orders during typical seasonal lulls or even areas where your orders tend to have a lower average value. You can offer limited periods of just a day or two that will motivate your loyal customers to purchase based on deal scarcity. Most consumers are more likely to purchase when they feel under the pressure of a quick decision, knowing they will face shipping costs after a day or two passes. You can offer promo codes that are different for varying sized orders to encourage higher spending. If your average order size is $75, a 10% off code may be used up to a purchase of say $100, and then orders after $100 may have a 15% off promo deal. Your promotional codes may not even include all your products, avoiding a loss of money on things that are regularly purchased or already big sellers. A promo code based on qualifying orders will help your audience increase their orders with the promise of a better deal. Increase what your audience is buying by offering products that are bundled. You see retailers do this all the time with phone chargers (cord, charger or cord bundled with charger), toolkits, software and much more. Increase the Amount Purchased: Customers may choose to buy bundles because they feel as if the items go together and make sense to purchase at the same time. When Starbucks bundles a bag of their holiday house grounds with a branded coffee mug, people often choose to purchase the bundle over just the bag of grounds—even though it costs more and they don’t actually need a new mug. Parents often buy their kids coordinating outfits that are bundled, paying more for an outfit that feels complete verses just the pants or shirt they actually needed. Increase the Discount Perspective: Disney resorts have increased the likelihood of people wanting to stay at the resort as they’ve bundled park passes and room costs. Giving a slightly better deal for two or more items can increase the purchase amount when your customer feels as though they are getting a good deal on the individual items. While a customer may not need 4 wrenches in a set, they may choose to purchase the entire set because it is a much better deal per wrench than purchasing only the individual ones they actually needed. The bundle of wrenches may cost the same price they would have spent on just the select sizes they needed, but they also may not be quite as high of quality. Feeling as though money is saved on each item in the bundle might entice your customers to buy the packages that actually have a bigger profit margin for you. Increase the Value: Companies can use this opportunity to get their customers to purchase an item that may not be as big of a seller by bundling it with a popular item. Tickets for shows are often bundled to increase the value. When a big performer is only going to put on a shorter show, the venue will often select an opening act. A customer is more likely to pay for an opening act and main act, despite little interest in the opening act because the value of seeing a longer show has increased the price of the ticket. When DVD bundles are created from short cartoons, like Peanuts or Sesame Street, you might see three or four different and unrelated episodes placed on the same disk in order to increase the value of the overall product. Without these bundles, people would have no real interest in the product or would value it far less. You can offer products that go hand-in-hand to increase the order size of your customers. Cross-selling means offering a product, like suggesting a paired wine with a specific menu option or prompting a face scrub with a facewash. Be aware that most of your visitors will be aware of this tactic and may not be highly influenced. Make sure your cross-sell offers are helpful and not simply pushing more products. Seeing a suggest for a fish bowl when you are buying dog treats is not going to encourage sales any more than any other suggestion out of left field. The wrong cross-sell might even derail a purchase entirely by distracting your customer or making them feel as if your site isn’t easy to navigate. The right cross-sell options as the right time are key to increasing the order. Predictive Intent found that cross-selling was 15 times more effective when it was offered at checkout. Get your customers the right products at the right times. Upselling works 20 times better than cross-selling during the purchase making phase, according to PredictiveIntent. You want to encourage your customers to spend more by offering a higher-end product that is an upgrade of what they are showing interest in. Most customers know what they are looking for and don’t want another product distracting them. If your customer is looking for a laptop, for example, they are more likely to be interested in items that are a better value or higher quality item. You can upsell the higher quality laptop that is one or two steps above the laptop they select to look at. Later, you can consider cross-selling a printer or laptop bag when the customer has actually chosen the laptop they wish to purchase. An early cross-sell might make them feel overwhelmed in the buying process. You might be rushing customers to checkout without even realize it. Keep your customers in the buying mode by keeping them on the product page even after they’ve added an item to their bag or cart. Make it easy for them to get back to their previous search or menu so that they can continue browsing the items they are interested in. Keep the cost of the total order clear without forcing them to visit shopping bag or start inputting information. You want to keep consumers engaged in buying and avoid sending them to checkout early. You also want to keep total costs and shipping costs very clear so that customers aren’t surprised by the total costs when they do go to checkout. The number one reason cited for cart abandonment is due to unexpected fees or shipping costs. A loyalty program is important for getting customers to buy more often and buy more with each purchase. You can get customers to increase their purchase amounts by giving better loyalty points for more dollars spent. You can give bonus points for passing certain order size thresholds or item quantities. Ideally, you want your reward program to encourage your customers to buy more, more often. Getting customers to purchase more on a given trip will take strategically testing various approaches to see what is most enticing to your customers. Larger orders on average from each customer means you can focus more of your energy on individual customer experiences than on acquiring new leads. While you want to grow your customer base, you want to ensure you are getting as much as possible from each converted lead.